Not all of my spare time -- just most of it -- is spent papercrafting. I also sew. Occasionally. Very occasionally. Not often enough. But most often, it's sewing on my cards. Which I guess doesn't really count as sewing. 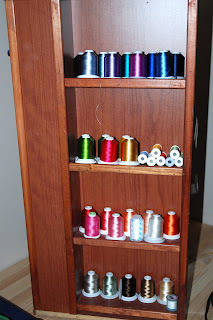 Can you tell I am feeling very slightly guilty about not sewing more? You might ask why I feel guilty ... so here's the answer. 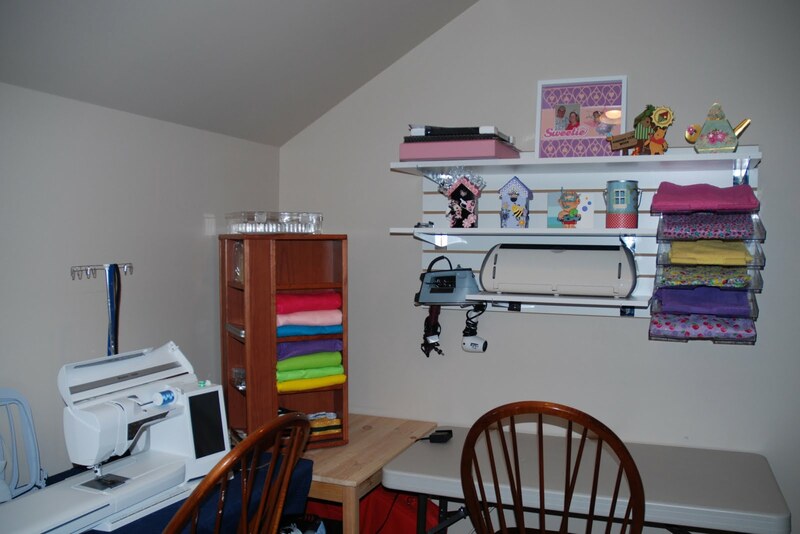 When I decided to convert my upstairs loft into MY area for hobbies, I invested a TON of money in a gem of a sewing machine. It's a Husqvarna Diamond, which means it also does fine embroidery along with the simple straight stitches I put on cards. It cost more than my car is worth! My local Husqvarna dealer has a section of my local Joann's store. So shortly after bringing home this baby, its accessories, its very own embroidered rolling luggage (!!! ), dear daughter Emily asked if I'd consider getting her a Cricut for Christmas that year. 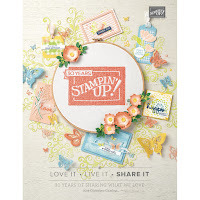 On my next trip back to Joann's "for thread", I bought "Emily's" Cricut. I was so smitten by the Cricut, I switched my hobby world (*SNAP*) that fast! 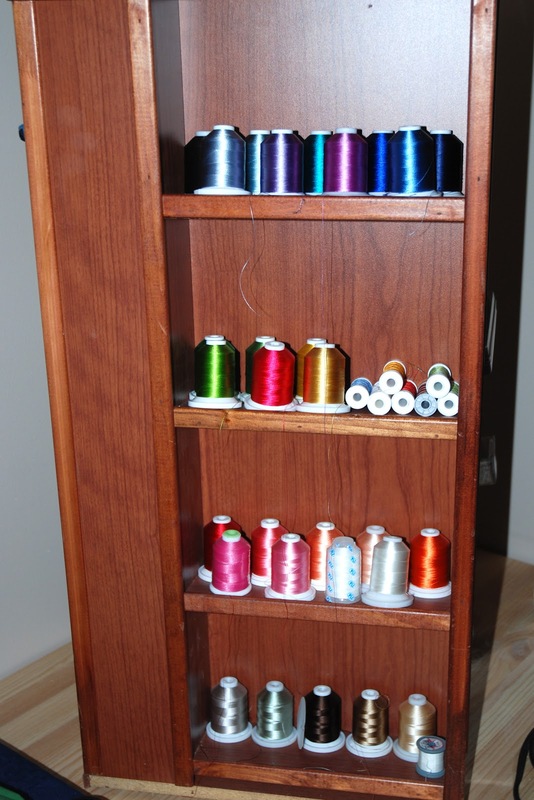 You may have noticed that I mentioned the word "thread" in there -- which is really the subject of this Organizational Part V post. The picture to the north of this post shows an adorable lazy-Susan display unit I purchased from a store going out of business. I like having my threads out where I can see them -- I guess I like having colors all around me. And here's what I did with the other half of the slatboard (refer back to earlier in the week, when I showed my paper storage on the other half). There, to the left, is the elegant Husqvarna Diamond sewing machine. I've spun the lazy Susan so you can see that this fits 1/4-yard pieces of felt in some of my favorite colors. On the far right of the slatboard, you'll see that I used some of the Plexiglas paper holders to use 1.5 yard pieces of the fabrics I'm currently using. 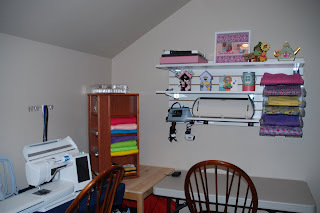 The wall also holds my iron and other plug-in electronics (including a spare Cricut E, a heat gun and an embosser). For now, I also use the shelves on the slatboard to show some of my favorite 3-D paper projects I've made. Here's hoping your world is filled with colors and joyful organization, too! 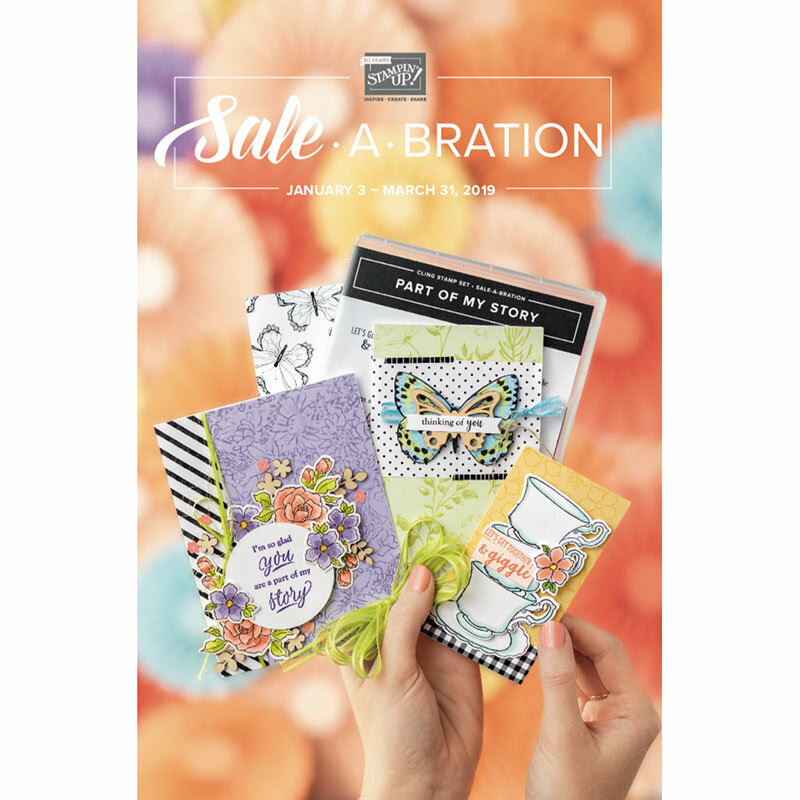 I found your blog through Madison at Funky Cards. You have my dream embroidery machine. I have a Janome 350E and my story is very similiar to yours. I got a cricut and my machine sits on the shelf. I'm hoping to use it more this holiday season. Then maybe I won't feel so bad every time I look over there and see if covered in it's neat little case. I really enjoyed your blog and am looking forward to your upcoming hop.